Abu Dhabi: United Arab Emirates (UAE) on Thursday awarded Indian Prime Minister Narendra Modi with its highest civilian award -- Zayed Medal. 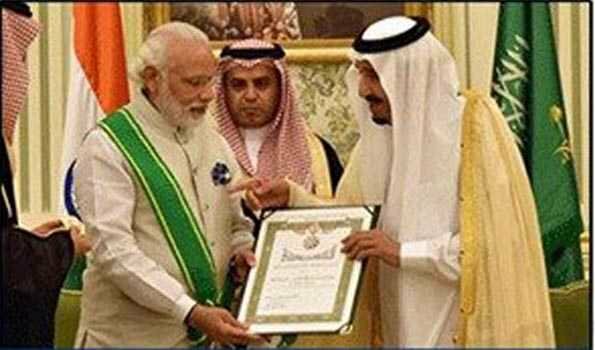 The UAE President Khalifa bin Zayed bin Sultan Al Nahyan honoured Prime Minister Narendra Modi with the Medal -- highest civil decoration of the country which is awarded to presidents, kings, and heads of states. "We have historical and comprehensive strategic ties with India, reinforced by the pivotal role of my dear friend, Prime Minister Narendra Modi, who gave these relations a big boost. In appreciation ofhis efforts, the UAE President grants him the Zayed Medal," tweeted the Crown Prince of Abu Dhabi.